We spend so many crafty hours working on the perfect card; wouldn’t it be great to turn it into a gift that your friend could use to decorate their home? Follow Maxine’s easy step by step tutorial on how to craft this gorgeous and effective make. 1.Choose a patterned, 12x12 sheet of Pretty Posy paper and cut it down to 17.5cm x 12.5cm. Adhere this to the centre of your card blank, this will allow a small border around your card. 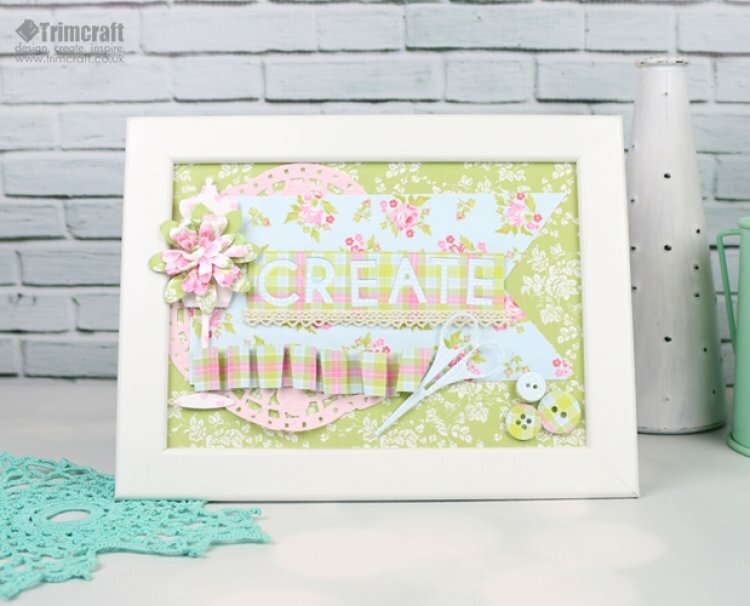 2.Take the pink doily from the Dovecraft Floral Muse range and glue this to the left of your card blank. 3.Cut a coordinating sheet of Pretty Posy paper down to 16cmx8cm. Create the fishtale end by measuring 4cm down on the right edge and from there, measuring 3cm in to the centre of the sheet. With a pencil, make a small mark. Next, diagonally cut across to that point, from each side. 4.Allow 1cm on the left handside of your card and then layer your pretty posy sheet across the centre of the card. 5. Next, choose two different sheets of Pretty Posy paper and cut both down to 10.5cmx 3cm. Spell the word ‘Create’ using the First Edition Alphabet dies across one of the strips. Die cut the words and put the letters to the side. TIP: Hold onto these die cut letters, they could come in handy for another project! 6.Glue the ‘Create’ sentiment onto the other pretty Posy strip you had cut out. Adhere your topper to the centre of the fishtale Pretty Posy paper. 7.Cut a 10.5cm length of Dovecraft Bohemian lace and glue this to the bottom of your sentiment topper. 8.It’s time to use the First Edition sewing dies! Die cut the mannequin, the scissors and buttons onto a variety of patterned Pretty Posy papers to add interest. 9.With the Dovecraft 3D foam pads, adhere the mannequin to the left of your card. Stick the scissors off centre, below your sentiment. Attach the buttons to the bottom right corner of the card, ensuring to layer a few to add dimension. 10.Die cut the First Edition layered Flower dies on alternating sheets of Pretty posy paper and layer the flowers from large to small onto your mannequin die with foam squares. 11.Cut a 12cmx2cm strip of Pretty Posy paper and place it onto your cutting board horizontally. Measure along and with a pencil, make a mark every 1cm. Score a vertical line at each mark. 12.To make the zig zag effect, fold your paper at each score line, back on itself. Follow this technique until you reach the last score line. 13. Adhere your zig zag strip to the bottom of your layered Pretty Posy paper sheets, ensuring to overlap the bottom of the mannequin die to add a textured effect. There you have your finished card. Once the card has served its purpose just take the glass out of a 5x7 frame so that your toppers won’t get flattened or damaged. Carefully add your card to your frame and there you have it, a pretty, crafty gift! It’s so simple to turn a card into a keepsake for a special friend. This make will look lovely as a home décor piece! How will you decorate your frame? Keep uploading your fab DIY crafts to the Project Gallery, we really enjoying seeing your inspired makes! When uploading on social media, ensure to #Trimcraft so we can have a peek at what you’re crafting.